Travis Johnson appeared on Show 145, recorded in September 2006, at age 13. 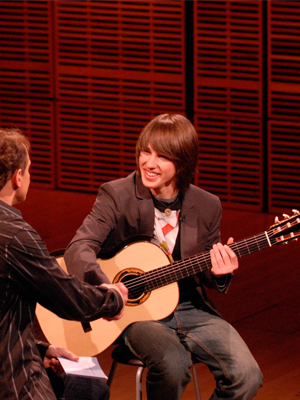 Travis Johnson (guitar) 13, is a home-schooled eighth-grader in his hometown of Milwaukie, OR. He studies guitar with Peter Zisa at Cascade College, and when not playing music, Travis is on the swim team, and enjoys lighting off rockets, air-soft guns and playing cards. Travis received the Jack Kent Cooke Young Artist Award in conjunction with his From the Top appearance, and also received the Cooke Foundation’s Young Scholars Award in 2007. Travis is a Jack Kent Cooke Young Artist.